Life was precious to Tchaikovsky. This was noticeable in many ways, among others in his passion for keeping a diary. Every day had great value for him, and the thought that he must bid eternal farewell to it, and lose all trace of its experiences, depressed him exceedingly. It was consoling to save something from the limbo of forgetfulness, so that in the time to come he might recall to mind the events through which he had lived. In old age he believed it would be a great pleasure to reconstruct the joys of the past from these short sketches and fragmentary jottings which no one else would be able to understand. He preferred the system of brief and imperfect notes, because in reading through the diaries of his childhood and youth , in which he had gone more fully into his thoughts and emotions, he had felt somewhat ashamed. The sentiments and ideas which he found so interesting, and which once seemed to him so great and important, now appeared empty, meaningless and ridiculous, and he resolved in the future only to commit facts to paper without any commentary. Disillusioned by their contents, he destroyed all his early diaries . From Tchaikovsky's early diaries only twenty-five isolated entries have survived made between 11 June and 18 July 1873 (TH 410), starting with his departure from Russia for a trip through Germany and Switzerland and concluding with his arrival in Italy. So far as Modest remembered, Tchaikovsky maintained a regular succession of daily entries of a diary from the end of the 1870s for about next ten years: "He never showed it to anyone, and I had to give him my word of honour to burn it after his death. After all, he had done so himself, only sparing what might be seen by strangers". From this set, a further eleven diaries (including various fragments) have survived, all of them relating to the period 1881 to 1891. Most of the entries were written in note-book format by Tchaikovsky himself; there is one copy made by Modest Tchaikovsky (TH 411), and one diary (TH 413) is represented only by a single sheet of paper. Three of these diaries form a more or less consecutive narrative, covering the period of twenty three months, from February 1886 to December 1887. Of the remaining eight, the longest runs for nearly six months, and the shortest for a couple of weeks. The diaries for 1881 and 1885 are the scrappiest of the lot and were not published with the rest: the 1881 diary (TH 411) contains some twenty four short entries with music samples from Tchaikovsky's opera Mazepa, and was only published for the first time in 2003; the diary for 1885 (TH 413), which remains unpublished, consists of a one page fragment which concerns his illness and describes him meeting his friends at a railway station. Another diary (TH 415), contains no information on day-to-day activities, but reflects Tchaikovsky's philosophical and aesthetic views, formulated in a series of widely spaced entries between 1886 and 1888, apparently for posterity. The extant diaries relate principally to the period of the 1880s, which has proved to be Tchaikovsky's most important years, in terms of both biography and creativity: as his fame spread through Europe and America, his way of life became more stable and rewarding. Even when his diaries reflect only the external aspects of his existence, they are important as documentary evidence, providing an account of daily events as well as intimate glimpses into the musical world of the day. When, as frequently, the diaries take us into the composer's workshop or offer an insight into his sensitive and thoughtful nature, deeply affected by the issues of art and life, they are of absorbing interest. 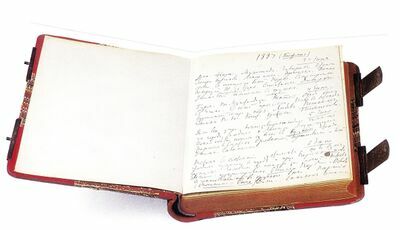 Varying greatly in form, Tchaikovsky's diary entries also range widely over space, from the Russian countryside he so dearly loved to Europe's most sophisticated cultural centres — Saint Petersburg and Moscow, Paris, Berlin, Leipzig, and London — closing with a remarkable record of his visit to United States in 1891, only two years before his death. Parts of Tchaikovsky's diaries, especially those that refer to music, were first reproduced between 1900 and 1902 by his brother Modest in his well-known biography The Life of Pyotr Ilyich Tchaikovsky . In 1919 another brother, Ippolit (a retired naval officer) came to work at the Tchaikovsky Museum and Archive in Klin. Even though he was never on intimate terms with either the composer or Modest, he edited (with notes supplied by Nikolay Zhegin and preface by Sergey Chemodanov) the publication of the 1923 volume containing most of the diary entries . This publication, early after the Bolshevik revolution, went virtually uncensored, but it possessed multiple other defects. It suffered from Ippolit's and Zhegin's lack of knowledge of Tchaikovsky's private and social life, so that a number of individuals mentioned in the text were left unidentified, as well as from the editor's random cuts, made at whim. For some reason in that edition the diary fragments for 1881 and 1885 were omitted altogether. In 1945 Tchaikovsky's diaries were inadequately translated into English, with notes by Wladimir Lakond and published in the United States . Based on the aforementioned inaccurate Soviet edition, and further plagued by the American editor's uninformed views on Russian social and cultural realities, this publication entirely failed to take into account the human dimension of the great composer. Thus, for instance, Lakond went so far in his notes as to pronounce Tchaikovsky's ruminations on his health or on his passion of playing cards to have been the signs of homosexual anguish—a statement which much contributed to the distorted view of him as a psychotic personality, which until very recently has dominated Tchaikovsky scholarship. In consequence, it can be argued that no other figure of comparable significance has been ever so grievously misconceived by both biographers and the historians of music. It has become imperative to re-translate and re-edit Tchaikovsky’s diaries, and to re-evaluate their significance. The transcriptions being published here on Tchaikovsky Research will provide a full and accurate new English translation, alongside the original Russian, and carefully checked against the original texts preserved in the Tchaikovsky House-Museum at Klin. The detailed and updated commentary in the notes will further enhance the value and interest of this material, and correct many errors in all previous publications. ↑ Quoted in Воспоминания друга (1980), p. 30. ↑ Жизнь Петра Ильича Чайковского, том 1 (1900), p. 407-408. ↑ Жизнь Петра Ильича Чайковского, том 1 (1900-02). ↑ Дневники П. И. Чайковского (1873-1891) (1923). ↑ The Diaries of Tchaikovsky (1945). This page was last modified on 7 April 2019, at 14:32.